Explore this wonderful canyon, a Wilderness Study area, with CFI Naturalist-Guides; small group, side canyon hike, behind the scenes stories, history, geology and exciting whitewater too! This is a 17 mile river trip that offers an insiders perspective on Westwater Wilderness Study Area at a slower pace. 30 days advance notice to set up a charter/custom trip; launch dates limited. A Bureau of Land Management ranger station is based at the head of Westwater Canyon where we check in and sign up for an assigned campsite. We will take exploratory walks in one of Westwater’s beautiful side canyons, look for animal tracks, wildflowers, signs left by ancient peoples, and more recent colorful mining and river runner history. The trip is led by CFI Naturalist-Guides who share geology for the layman and how the river now flows through the black rock “roots of the Ancient Rockies!” For younger folks, we do some of our fun-to-learn science activities and games. And of course there are the 6 miles of exciting Class III rapids like “Funnel Falls,” “Skull,” and “Sock-it-to-Me” to thrill even the veteran river runner. 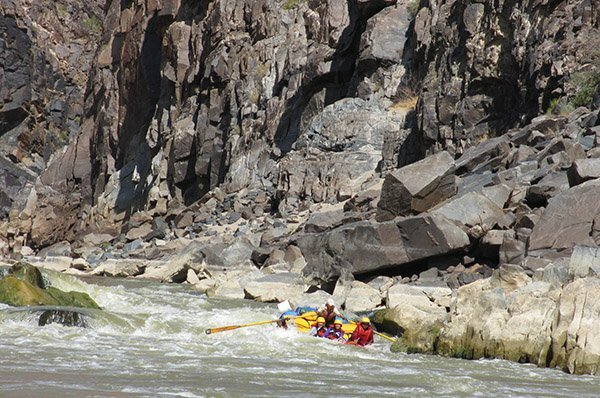 These help make Westwater one of the premiere whitewater stretches in the west. We run the rapids the last morning; enjoy a celebratory lunch and closing comments. Once the minimum of six paying participants is met, your group leader is offered a complimentary spot plus the BLM special fee. All additional participants are full fees. (BLM Special Area fee still applies to all participants).